This adorable cat at the Movies theme comforter and sham set is the perfect addition to your child's bedroom. 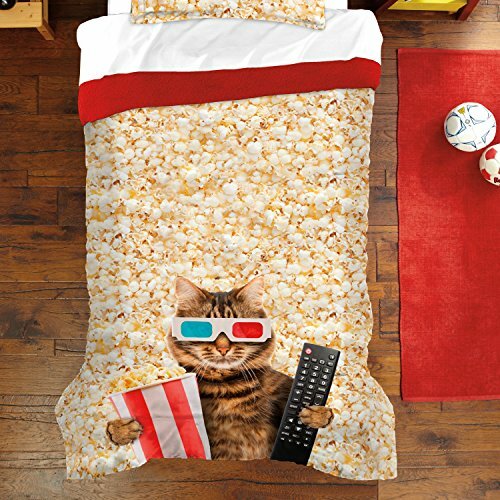 This face of the comforter spotlights vibrant digital printed color graphics of a cat ready for the Movies with his remote, popcorn container, 3-D glasses and popcorn! the face of the standard sham features a coordinating popcorn print. Comforter and sham reverse to solid Red. Constructed of 100-percent cotton, this set offers style and comfort and is machine washable. Please note: sheet set shown is not included. 100Percent cotton. Polyester fill. Machine washable. Imported. Full/Queen comforter set includes: one Full/Queen comforter (88 in. W x 88 in. L), two standard shams (20 in. W x 26 in. L). If you have any questions about this product by dream FACTORY, contact us by completing and submitting the form below. If you are looking for a specif part number, please include it with your message.